The natural color of our teeth changes over time. Not only the shade of our teeth becomes darker, but we also get unwanted stains that become difficult to remove if we don't take care of them immediately. Drinking coffee and smoking can wreak havoc on the general well-being of your teeth. In many cases, stains occur because of aging, trauma or exposure to certain medications. There are several ways we can whiten out teeth. Too many whitening kit products are easily available to benefit all consumers. However, only a few of them deliver satisfactory results. It is important to choose only the best brands that manufacture safe and reliable products to help people whiten their teeth. Be careful while selecting trays, strips or kits to brighten your smile. 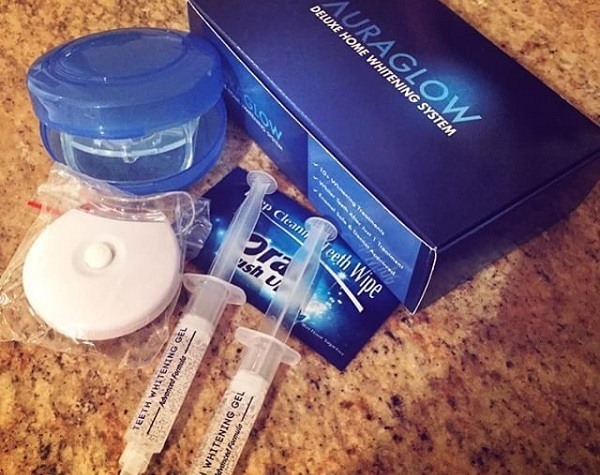 The AuraGlow Teeth Whitening Kit is a great product that is widely popular for its whitening capabilities. You get a couple of teeth whitening gel syringes that offer 20 whitening treatments. It contains 35% carbamide peroxide. Manufactured by AuraGlow, a trusted name in the industry, the product is made in America with a kosher and gluten-free gel that is completely safe to use. There are many features of the AuraGlow whitening kit that give you whiter teeth in just a single whitening session. You can achieve maximum results with regular treatments. Mouth tray needs no boiling or molding, which implies that it is made to fit any mouth. 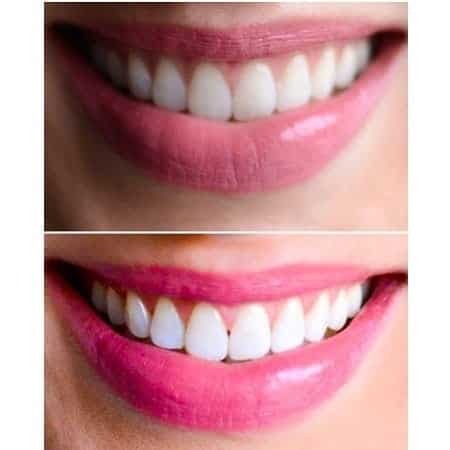 You can easily brighten your top and booth teeth with this incredible whitening kit. This a great mouth tray is suitable for any mouth size. If you don't want to waste your precious time to boil moldable trays, then this is the best product to whiten your teeth. It sits cozily in your mouth to cover your upper and lower teeth. This kit contains lithium batteries. Hence, take care while storing this device. Keep it in a cool and dry place so that the batteries do not get exposed to extreme temperatures. Users should never handle the batteries and device with wet hands. Never submerge or wash the device (or batteries) in water. Do not heat or charge the batteries and avoid any contact with foreign objects that can puncture the batteries. Any battery damage can cause a short-circuit. 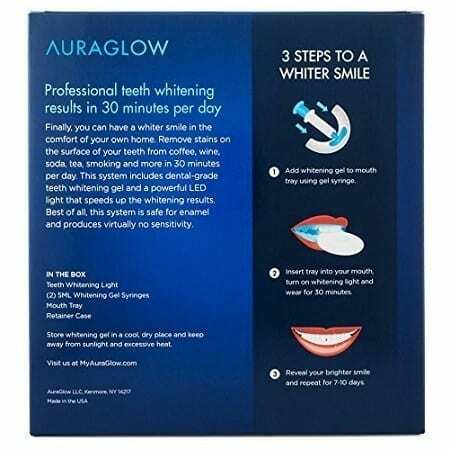 Although, the AuraGlow teeth whitening kit is safe to use, discontinue use if you notice any reactions. These symptoms may include gum soreness, swelling, redness or irritation. This whitening kit should is not suitable for children under 12 years or pregnant women. There are hundreds of whitening trays, strips, and gels available in the market. However, these do not enjoy the popularity the AuraGlow whitening kit has received. All customers who have bought this kit are delighted with the whitening results of this product. It is easy and convenient to use without any sensitivity reactions. The kit offers professional level results. The whitening kit gives you the same results you would get out of a professional dental cleaning. If you want to stay away from low-quality teeth whitening lights that come with just a single LED bulb, get this product today. Customers are particularly happy with the powerful blue LED light that has five bulbs for accelerating the whitening process. The light attaches to the mouth tray for shining directly onto the teeth. People who use this kit have given positive reviews about the product and declare it as a safe teeth whitening kit. Since the light beeps after every 10 minutes, users do not have to keep track of time. There are dozens of over-the-counter teeth whitening strips that are not only messy but fail to deliver the desired results. 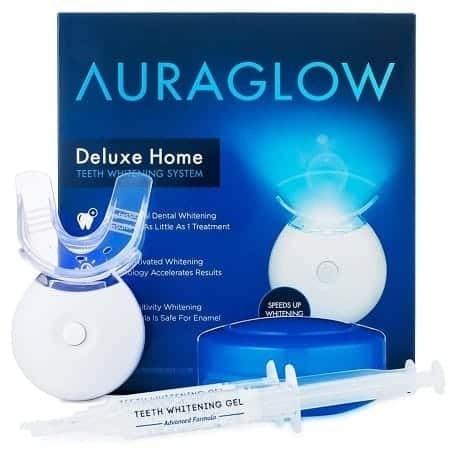 The AuraGlow Teeth Whitening Kit is currently the best-LED teeth whitening product that is widely popular among smokers and alcoholics who want to get rid of stains immediately. The kit has a good rating at Amazon.com where you can buy it for a price of under $50 with free shipping. 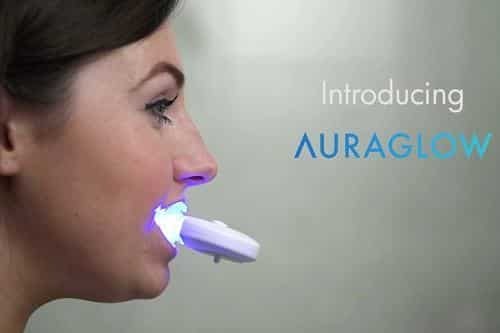 The AuraGlow Teeth Whitening kit is an incredibly convenient teeth whitening technique for exceptional results. It not only delivers a uniform application but protects your gums and teeth from any allergy or tooth sensitive reactions. If you want noticeable results with just one treatment a day, invest in this inexpensive teeth whitening method. With just 30 minutes a day, you experience a convenient teeth whitening session without having to wait for your next dental appointment.